Carson-Newman’s Online RN-BSN Program, Online RN-MSN-FNP, Online MSN-FNP Program and Online Post-Master’s FNP Certificate Program are accredited by the Southern Association of Colleges and Schools and the Commission on Collegiate Nursing Education. 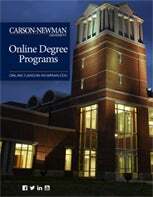 The Princeton Review commended Carson-Newman University as one of the “Best in the Southeast for 2016.” The university has also been recognized as a “college of distinction” by CollegesofDistinction.com, and named to the President’s Honor Roll by the U.S. Department of Education for the university’s focus on ‘service with distinction’. Carson-Newman University has also been ranked No. 13 in Best Value Schools, No. 34 in Best Colleges for Veterans and No. 76 in Regional Universities South by U.S. News & World Report. Carson-Newman’s Registered Nurse to Bachelor of Science in Nursing Online Program, Registered Nurse to Master of Science in Nursing - FNP Online Program, Master of Science in Nursing – Family Nurse Practitioner Online Program and Post-Master’s FNP Online Certificate Program provide busy nurses access to the same academic excellence enjoyed by on-campus students, while providing a supportive learning environment that works around your busy schedule. Learn more about our caring faculty of expert nurse educators who are active nurse practitioners in their own communities. Click here to view our faculty.